New – Screaming Eagle Adventure Park Zip Line Video! Verified by Guinness World Records, Historic Banning Mills has the longest and largest canopy tour in the world! We have some of the best and ultimate high speed, extreme zip lines you could ever experience. You do not want to take your friends and family anywhere else! 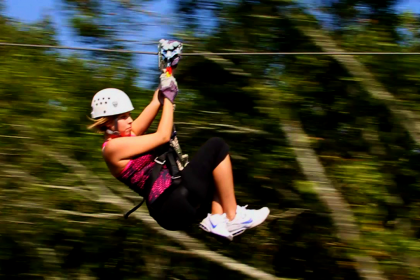 We will give you an unforgettable experience as you zip, soar, and explore over ten miles of zip line in the trees. With six levels of zip line tours to choose from, you will have an amazing experience no matter which tour you select. Our zip line course has over 50,000 lineal feet (10 miles) of zip lines that run throughout the canopy in the trees at the Historic Banning Mills Adventure Park! Not only are we pioneers in high speed and extreme zip lines, we are the most experienced zip line course in the world! Enjoy all of our zip line tours, as well as our newest zipline, The Amazing Flight of the Falcon! A super eco zip line, The Amazing Flight of the Falcon at Banning Mills is 3,400 feet long, one of the longest and most exciting zip lines in the world! (Guests must weigh at least 110 pounds due to winds and length to experience The Amazing Flight of the Falcon). Click to view the video here! Open all year long, Historic Banning Mills gives you the ability to experience extreme adventure and fun whenever you want! Remember, you must call to make your reservations!